Earthquakes, tornadoes, volcanic eruptions! Kids model and demonstrate the phenomena that shape our ever-changing planet while learning about plate tectonics, meteorology, air pressure and more! Every participant makes and keeps their very own erupt-able Volcano! Volcanoes can't be erupted the day of the program (they need time to harden), so we bring a larger version of our own to erupt as the big finish to the program. 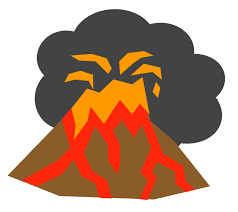 We suggest letting the volcanoes dry in your classroom and having an "Eruption Party" two days later! Each student will need to wash their hands at the end of the program (their hands will be covered with "volcano"). The Earthquake Experiment performed during "Dynamic Earth" uses a Milky Way candy bar. Milky Way bars DO NOT CONTAIN Peanut products, but since they are manufactured in the same facility as Snickers (which do contain peanuts), we would like to call this to your attention. As a rule, our instructors do NOT allow any participants, even those without allergies, to eat the Milky Way.